What happens when a Hall of Fame wants to induct someone, but that person won’t pick up the phone? Lucky for Daryl Whitley, he didn’t have to find out, but he almost did. The Indiana High School Tennis Coaches Association Hall of Fame selected Whitley to join its 2019 class, but when Ivan Smith, who’s in charge of the selection process, tried calling with the good news, Whitley wouldn’t answer. He thought it was probably someone trying to sell him something. It wasn’t until Frank Morton, who helped nominate his longtime friend, told him to take that call in December that Whitley learned he was going into the Hall of Fame. During his time at John Marshall High School in the late ’70s and early ’80s, Whitley lost just three singles matches in three seasons — he didn’t play his freshman year — and never lost to another Indianapolis Public Schools opponent. He was an all-state selection his last two years, and the Central Indiana Tennis Association ranked him No. 1 in singles in that time. It was a list of awards and accomplishments that made some wonder, why wasn’t he in the hall of fame sooner? One of Whitley’s John Marshall teammates, Todd Van Duyn, reached out to the Midwestern Tennis Association, where Whitley had been dominating tournaments since he was 13, to see what he could do. The organization told Duyn to get a hold of Morton, the current president of the Capitol City Tennis Club in Indianapolis at Riverside Park, where Whitley started training when he was 14. Capitol City and the Midwestern Tennis Association operate under the American Tennis Association, which was established in 1916 when the more mainstream United States Tennis Association didn’t admit Black players. Duyn and Morton compiled every relevant stat available and nominated Whitley. “We thought with all his statistics he should’ve been in the Hall of Fame many years ago,” Morton said. Smith, who last year at Center Grove High School became the winning-est tennis coach in Indiana High School Athletic Association history, has been in charge of the last five Hall of Fame classes and said he’s been trying to go back and get players who were clearly qualified but hadn’t made it in yet for whatever reason. Whitley, who according to Smith will be the fourth African-American inducted into the Hall of Fame, was one of those players. Those who knew Whitley from his high school days agreed. Robert Hill, a former president of Capitol City, remembers getting a “skinny little kid” to his club in the later 1970s. It was Whitley, who may have been small, but Hill said he made up for that with a competitive attitude and natural talent. Capitol City taught Whitley the fundamentals of tennis: how to hold the racket, move around the court and practice good ethics. Whitley played tennis for the first time just two years earlier when he was 12. During a weekend visit with his father, Whitley turned on the TV and saw a tennis match — he later learned it was Wimbledon — and wanted to try it for himself. He borrowed his dad’s racket and went to the court at the apartment complex where his dad lived, and happened to meet a stranger waiting on a hitting partner who never showed up. The two of them played and Whitley, who didn’t even know what tennis was before he saw it on TV, learned he had an affinity to the sport. Being an African-American tennis player had its challenges — there were very few Black players at tournaments — but Whitley said it wasn’t a terrible experience since Capitol City was a refuge for young Black players. As a bonus, Whitley said playing against and beating players from wealthier areas with better training let him know he was pretty good. By the time he was 14, Whitley was ranked No. 3 in Central Indiana by the Central Indiana Tennis Association. The first time Duyn saw Whitley play was at the end of Whitley’s freshman year, when the tennis coach introduced him to the team and told them he would be playing with them the next three years. Whitley took the court against a good senior that day, warmed up for a little bit and then beat him 6-0 in about 15 minutes. Whitley is still involved in the local tennis scene. He’s on the board of the National Junior Tennis League of Indianapolis, an organization that teaches tennis and life skills to undeserved youth. Whitley also plays in the Mid-Tac Championships, put on by the Midwest Tennis Association. He’s won 12 singles titles at Mid-Tac, including one just last year. 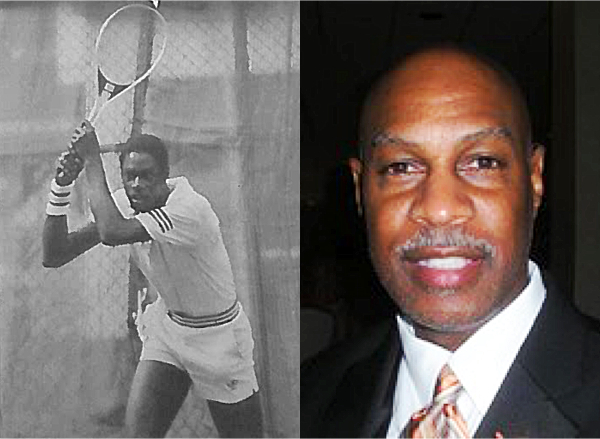 Daryl has served as mentor and hitting partner for several Indiana High School standouts. They include Ashley Davis-Girl’s State Singles Champion and #1 Singles player for Wake Forest University, Tiffany Welcher-Girl’s State Singles and Doubles Champion and #1 Singles player for the University of Alabama, Chelsea Carter-North Central High School and Girl’s State Singles Runner-up, Alex Toliver-Cathedral High School and #1 singles player for the IUPUI Jaguars. For the past six years, Daryl has served as a member of the Board of Directors for the National Junior Tennis League (NJTL) of Indianapolis. In 2013, Daryl and his daughter Jaelyn received a special invitation to represent the NJTL Indianapolis Chapter for the Advocacy Day event held in Washington, D.C. where he spoke with legislators on Capitol Hill encouraging them to continue providing funding for NJTL programs throughout the country. He also traveled with current NJTL Executive Director Monica Brase to attend the 2016 NJTL Capacity Building Program in Las Vegas, Nevada. This initiative provided him an opportunity to meet and network with other NJTL Chapter representatives in order to bring back innovative ideas that would positively impact the NJTL program here in Indianapolis. Daryl has been selected to be a guest speaker at several NJTL fundraising events. Due to the volunteer hours he has dedicated to our NJTL chapter, his employer, State Farm Insurance Company, has provided our NJTL chapter with grants over the last several years.